The Cord Coalition is now threatening to crack the whip on MPS believed to be too friendly to the ruling Jubilee coalition. During a joint parliamentary Group meeting of the Cord affiliate parties, it was proposed that rebel MPs risk stern disciplinary action, including losing their seats in Parliament. Also put on notice are Cord allied MPs who have been vocal in opposing the proposed referendum being spearheaded by its three principals, Raila Odinga (ODM), Kalonzo Musyoka (Wiper) and Moses Wetang’ula (Ford Kenya). Sources say those who have been put on close watch are a number of MPs from Coast region some of whom had gone public that they were working closely with jubilee. Cord has now asked MPS with one foot in the Government and another in CORD to quit and seek a fresh mandate if they think they are strong on the ground. 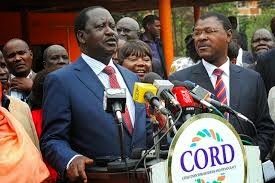 Cord has now instructed its lawyers to study closely the Political Parties Act which allows parties to discipline members for violating both the Act and their respective party constitutions.